Our winning feline Moggy of the Week is JD Rimmer, a gorgeous 14 year old Ocicat feline that we think looks exactly like the cat on the front of the Webbox wet food pouches. 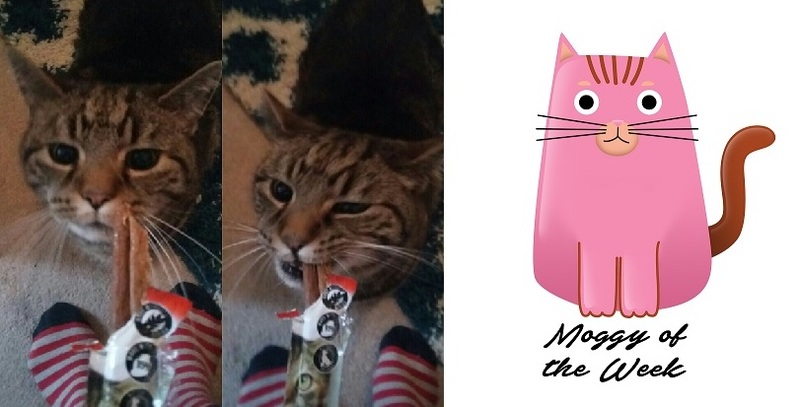 JD’s mum Sarah even told us that he “loves his Webbox Cat’s Delight Tasty sticks and has one every evening at 8pm sharp” so it’s no coincidence that we immediately linked JD to the pet brand’s furry feline. The photo Sarah sent us shows JD’s immense surprise and excitement at finding out that his nightly pack on the day the photo was taken contained not one, but two of his favourite treat sticks – aww, look at that wee face. Ocicats may look wild, with their tiger markings and eyes, but in actual fact they are very gentle and loving kitties that are friendly, sociable and like visitors. Because of this amazingly confident and not often shy temperament, they make particularly good pets for families with small children and they tend to get along with other animals, so introducing a new kitty into the house of an Ocicat isn’t something to steer away from. They are very toy-orientated though – their hunting instincts are more tiger than the usual cat – so they need a lot more human interaction and attention than most cats, so playing with them daily is a must for Ocicat parents, like Sarah. However, they do love to snooze – as all cats do. Ocicats like JD are also surprisingly trainable – like dogs. Things like walking on a leash, sitting down when told to and even being able to bathe them in water are all doable with Ocicats, in time. How cool is that?